Baltimore (Agenzia Fides) - The situation of migrants in the United States is increasingly becoming a "situation at risk" due to the tension created by the caravan of Central American migrants that is now close to the border with the United States. Those who have long been living in the United States, try to regularize the documents for their stay, but it is increasingly difficult without someone who has legal skills and a little 'experience. 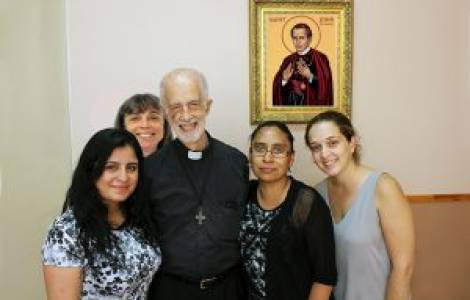 The resources of the Catholic Church are among those who help undocumented migrants, like Father Piedra, a Redemptorist priest, who has been living in contact with migrants for some years. Father Ruskin Piedra, CSsR, a native of the Baltimore province, runs a legal aid center in Sunset Park, Brooklyn, where he fights against the expulsion of migrants. His work has become more difficult lately. The New York Times dedicated a long article to him on November 8th. Father Piedra, 84, often goes to the Immigration Court in New York, in the center of Manhattan, where he defends those facing deportation or seeking asylum in the United States. In 2003, he founded the John Neumann Center, a non-profit organization that provides legal immigration services at affordable costs to the Sunset Park community in Brooklyn. Its headquarters are on the second floor of a building owned by the Redemptorists, where Father Piedra also celebrates mass every afternoon. The note sent to Fides by the Congregation of the Most Holy Redeemer informs that Sunset Park has undergone a demographic transformation in the last 50 years, passing from a predominantly Irish, Italian and Scandinavian neighborhood to a predominantly Hispanic and Chinese one. This process has meant among other things, for the priests responsible for the church of Our Lady of Perpetual Help, the need to celebrate daily Masses in English, Spanish and Chinese, to meet the spiritual needs of the faithful, many of whom are without documents.